Eman Martin-Vignerte was born in Qatar and studied electrical engineering at Paderborn University and medical equipment engineering at the university in Ulm, both in Germany. Eman joined Bosch in 1999 as a software engineer to work for common rail diesel engine, where she developed both software and hardware for the Electronic Diesel Control (EDC) during her first four years. In 2004, she moved on to the automotive division responsible for the Hyundai customer, becoming a team leader for the change management activities. 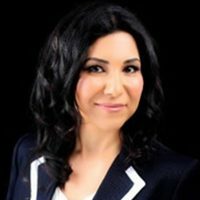 Three years later Eman took on responsibility for business development for “healthcare telemedicine” (the remote diagnosis and treatment of patients by means of telecommunications technology) in the UK. Since 2013, she has been head of political affairs and government relations, where she plays an active role in explaining advances in “smart cities” to the government. She is an expert in and passionate advocate of the “smart city”.